Pacer Inn is less than 1 mile from Ohio Wesleyan University. Business Center, 100% Smoke Free, 24 Hour Desk. Start your day off right with our Free Continental Breakfast. enjoy a delicious onsite meal at El Vaquero Mexican Restaurant and Bar. 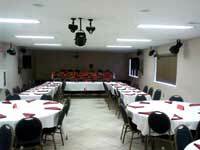 Meeting Room available for guests for Business and Family Functions. Complete setup available along with AV Equipment. Extended Channels, Fridge, Microwave, Hair Dryer, Coffee Maker, and Living Space. Full Kitchens, Extended Stay Living with all the amenities.. Located in the heart of historical downtown Delaware, the Pacer Inn is less than 1 mile from Ohio Wesleyan University, about a 5 minute walk. Families will love spending the day at the Zoombezi Bay Water Park, Little Brown Jug, or the Columbus Zoo all within 15 miles of the Pacer Inn Delaware. The city of Columbus is just 25 miles, and The Ohio State University is 20 miles from the Pacer Inn. Guests of the Pacer Inn can stay connected with the free wireless internet and enjoy a delicious onsite meal at El Vaquero Mexican Restaurant and Bar, open 11am to 10pm daily. Free parking, fax and copy service, and the convenience of a 24 hour front desk reception area are offered at the Pacer Inn. All guest rooms are nicely appointed. Standard amenities include free high speed wireless internet access, hair dryer, coffeemaker, free local calls, alarm clock radio, iron and board, 32 inch flat screen TV with satellite, and individually controlled heat and air conditioning. We offer 34 new luxury suites with many amenities and services. The property is centrally located in downtown Delaware that make it convenient and close to downtown restaurants, OWU, entertainment, First Friday Night and other events that are scheduled throughout every month. Join us for food and fun! Delaware County’s 11th annual - Walk A Mile In Her Shoes Friday, May 3 Registration: 6 - 6:30 pm Walk: 6:30 pm FREE EVENT, open to everyone of all ages! Activities : In Delaware County, Ohio you'll enjoy camping, boating, fishing, hiking, swimming, and other outdoor fun activities. Delaware, Ohio is also home to two of Ohio's State Parks. Airport : Delaware Municipal Airport 1075 Pittsburgh Drive, Delaware, OH 43015 (740) 203-1870. Delaware Municipal Airport Jim Moore Field is a leading general aviation facility for central Ohio pilots and businesses. The city oversees all aspects of the airport. It is home to approximately 80 aircraft and handles an estimated 40,000 operations per year, including corporate activity, training and pleasure flying. Attractions : Delaware, Ohio offers big-time attractions and small-town charm just minutes north of Columbus, Ohio. With a wide range of activities and attractions, it's a playground for every generation to enjoy. Casinos : Hollywood Columbus Casino 200 Georgesville Rd Columbus, OH (855) 617-4206 There's No Place Like Hollywood Casino Columbus. A new Hollywood star is now open in Columbus, Ohio. Join us for the area's only Vegas-style casino with unparalleled amenities from fabulous dining to magnificent nightlife. Dining : Delaware, Ohio offers a variety of dining options, including upscale, down home, and fast food. Visitors coming to the area will discover affordable, comfortable dining with cuisine to satisfy the palate and please the pocketbook. Downtown : Downtown Columbus From the Scioto Mile to Columbus Common s to the award-winning baseball stadium to the nationally ranked Columbus Metropolitan Library and Columbus Museum of Art , the landscape changes the way we live, work and play. We have a little ways to go, but that's okay because we are open and smart. Events :From festivals every weekend in the summer months to light displays throughout the city in the winter, there's always something happening in Columbus! Check these highlights, or search our interactive events calendar for even more. Golf : Playing golf is a favorite pastime in Delaware County Ohio. When planning a visit to Delaware County, you'll find a multitude of great courses that will allow you to stay and play for awhile. Golf courses are located throughout the county, and 14 public courses are found in Delaware, Ohio; Galena, Ohio; Ostrander, Ohio; Powell, Ohio; and Sunbury, Ohio. Government : The City of Delaware operates under a council-manager form of government. Council, as the legislative body, represents the entire community and is empowered by the City Charter to formulate Citywide policy. City Council is comprised of seven members; three elected at-large by all city residents, while the other four represent the four city wards and are elected only by those ward residents. Hospitals : Grady Memorial Hospital 561 W Central Ave, Delaware, OH 43015 (740) 615-1000 Welcome to OhioHealth Grady Memorial Hospital. Grady Memorial provides the Delaware community with comprehensive quality healthcare delivered with compassionate, personal care. Our full range of services and programs meet the needs of one of the nation's most rapidly growing counties. Shopping : When it comes to shopping, Delaware County offers the best of both worlds. You'll find quaint, one-of-a kind antique stores, shops, and boutiques, as well as the world's finest fashion-forward retailers. Leisurely shop the quaint and historic downtowns of Delaware, Ohio; Powell, Ohio; and Sunbury, Ohio; or enjoy the hustle and bustle of Polaris Fashion Place -- one of Ohio's premier shopping malls. University : Weslayan Ohio University 61 S Sandusky St, Delaware, OH 43015 (740) 368-2000 The University Ohio Wesleyan University is a national liberal arts and sciences university with a major international presence. It is located in Delaware, Ohio, a small community just 20 miles from Columbus, the nation's 16th-largest city. OWU offers 93 majors, sequences, and courses of study, as well as 23 varsity sports. OWU is one of only 40 institutions featured in the highly regarded book Colleges That Change Lives. El Vaquero Mexican Restaurant : At El Vaquero ​we celebrate a proud tradition of preparing authentic Mexican food the way it was done on the range centuries ago. From the freshest meats and seafood to colorful vegetables and unique spices and sauces, each dish is an experience. Welcome to our great hotel in Delaware Ohio with affordable rates and cheap budget discount lodging. Pacer Inn and Suites welcomes you to our budget hotel in Delaware Ohio. 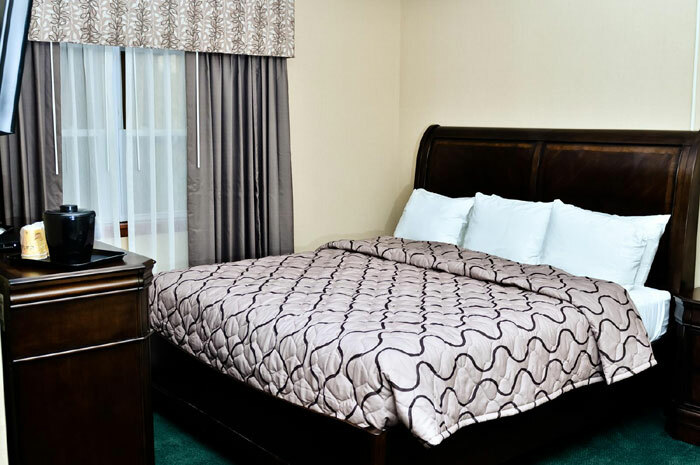 Pacer Inn and Suites will provide you excellent customer service with great amenities in comparison to all Hotels and Motels in Delaware Ohio. Please visit us on your next stay in Delaware Ohio and let us provide you with 4 star hospitality for 2 to 3 star budget rates. 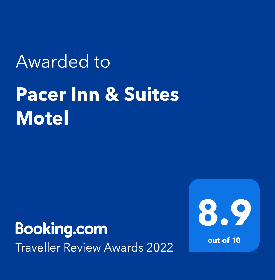 Pacer Inn and Suites has been providing lodging and accommodations in Delaware Ohio for sevaral years and looks forward to providing our valued customer and business traveler with the best service in Delaware Ohio for Hotels and Motels in our local area. 2018 Pacer Inn and Suites. All rights reserved.